Doubling Up: Let’s Play Two! The Minnesota Twins have watched their 2018 season of promise turn towards a different direction, and now ramble on towards a close. Over the course of the year adversity has been a common theme, and in dealing with it, a monumental struggle. When building out a 25-man roster talent obviously reigns supreme, but the addition of personalities able to influence the human element in the optimal way is of the utmost importance as well. Looking back on the offseason, it’s hard not to reminisce about how much talent was acquired through the dollars that were spent. A potentially unconsidered caveat however, is that the amount of one-year deals handed out played out counter-productively within the clubhouse. That sentiment has been offered by a few different publications, and the return of Matt Belisle was noted heavily as one rooted in veteran leadership. As a team takes shape, leadership is a quality that is both formed and earned. 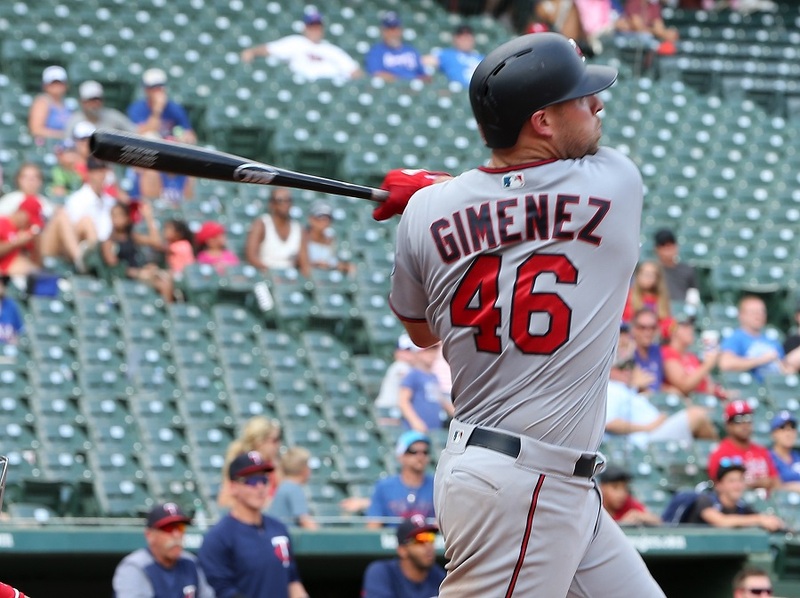 Despite being outside of the organization for the vast majority of the year, Chris Gimenez carries a strong reputation for being a veteran leader. When looking to discuss how that leadership impacts the game, a conversation with the Twins backstop seemed imperative. I was able to ask him a handful of questions, and he provided plenty of insight as to what level of impact can be made when the fans aren’t watching. Twins Daily: We often hear of "veteran leadership" as a term tied to why a player may be acquired. How is that defined for you? Is it a vocal thing, lead by example, or something entirely different? Chris Gimenez: Veteran leadership is all the above! It’s absolutely a vocal thing, it’s being able to see things and either address it with the individual or in a group setting. The veterans are the ones that have been there and done that and have either failed or succeed and now are there to offer advice or just lead by example a lot of times! TD: In assembling a 25-man roster, how important is it to have a true leadership presence. Is lacking in that area something that can be debilitating to a clubhouse? CG: In putting together 25 guys one of the most over looked but most important aspects of a team is the leaders! It would be like going into battle but without a plan of attack. Not having someone in that locker room to lead is absolutely debilitating. I’ve often found that the leaders of the clubhouse are the guys who do not play every day! They can see things from a different perspective and are often able to address things. TD: You've obviously been in plenty of big-league clubhouses, and now on two separate Twins teams. What are some of the most important takeaways from how a team comes together in your time as a professional? CG: Teams often really come together around the first month of the season or the first real hardship you encounter. A lot of times the 25 guys that start the year together haven’t had much time together in spring training. Getting guys in the clubhouse joking around having fun on the ball field is what creates that. We often do team dinners on the road to get guys together and hang out off the field. It’s great for building relationships and having all the guys on the same page. All teams are different in how they come together ultimately, but these things help that along a bit. Leaders are integral in facilitating things like this on and off the field. TD: It's probably a little bittersweet going from a contender to a team with no postseason chances this season. When something like that happens how do your personal goals change? What are you looking to bring to Minnesota over the final month? CG: You are right anytime you move down in the standings it’s not ideal, but honestly, I think it was the perfect move for me. This place has really felt like home and what we accomplished last year was nothing short of spectacular. When a group of guys believe in each other it can become a very powerful thing. My goal for the rest of the season is to help wherever I can. Through the twists and turns of a season the team has gotten a lot younger, which is a good and bad thing. My job now is to be a vocal leader in the clubhouse to show these guys how to go about their business daily. Show these guys what it means to be a good teammate and a big leaguer! I will help young pitchers in the video room, catch pens, and give feedback. I’ll also help young hitters with the in-game adjustments they will have to learn to make. Most importantly, I’ll be the guy who shows everyone how to have fun and know that’s ok to do as well! TD: Over the course of your career, you've been employed under both Thad Levine and Derek Falvey at multiple stops. What can you tell us about them as executives that fans may not see or know? CG: Thad and Derek are very smart guys. I know that’s not breaking news, but I think you can expect a very forward-thinking front office. I know they have a plan, and last year might have altered that a bit, but they are very smart and knowledgeable in what they do. Derek has a great eye for pitching so that should be one area to look forward to as they move forward. Thad is great with people and relationships as well as advanced metrics. The plan might have been reset a bit this year, so I think you will still see a competitive team but some young kids getting valuable experience. TD: As a veteran, you've crafted your game over a significant portion of time. Mitch Garver is playing through his rookie year this season and has seemed to progress nicely from early on. What's your assessment of him in the time you've spent working together? CG: First off, Garv has made big strides this year behind the plate! I think we all knew it was in there and the bat plays but Jason getting hurt this year kind of thrust him in there to learn on the fly and he has done a great job. He needs to continue studying hitters, and I’ve been really impressed with his ability to formulate and execute a game plan! This year has been a long one for him, and this last month can really get to you physically if you’re not used to it. Because of that, he will be better prepared in the future as well. I think there is a lot to like about Mitch in the very near future, and I won’t be surprised when he is a very good big-league catcher and has a long, great career. TD: Finally, having been a part of two Twins teams going in opposite directions, what do you think is the biggest factor in turning it around for 2019? Injuries and unfortunate situations have reared their head this year, but where does the biggest area of opportunity lie? CG: Health will always be a big part of the next year. Loosing Erv really hurt as the anchor of your staff wasn’t there. He’s the guy that was supposed to lead by example out there every fifth day. I also think some next steps from a few core players will help that as well. I really like some of the bullpen pieces we have for the future, as well as a few of the young starters. Continuing to sprinkle in guys to fill in the gaps will also help. I love the coaching staff in place, they do a great job with the young guys. So does he plan on becomming a Twins coach when his playing days are over? Interesting, but Gimenez has a massive self-interest in stressing the importance of "veteran presence", leadership, etc. It would be similar to me stressing the importance of cheap, nerdy fans. Very strange. We need Gimenez like we need a hole in the head. I generally like Molly but this veteran security blanket thing is silly. I think at this juncture of the season, it's an unfair assessment. If it was in a spot like Belisle, where he's taking away time from guys that have more to gain mid-summer, sure. Right now though, the rosters are expanded and they can maybe impart something on the guys that need to make a difference. In regards to his teaching from the bench comment, I wonder at what point you just ask these types of guys to help in a coaching type role rather than a roster spot. Maybe that doesn't have as much relatability then though? I think the whole leadership thing is overblown. I would rather have Astudillo getting innings behind the plate yet Gimenez is playing frequently. *This is current state, AFTER the talent dump-off. You can add a handful more wins if the talent dump didn't happen, which it might not have if Santana's production had been available. I don't think they believe in Willians as a catcher, just going off of his initial promotion providing time at 2B. Like I said above though, I'm with you to a certain extent. I'll believe the Twins clubhouse was toxic this year. I do think that there's a certain presence that a vet can bring. At some point though, the balance has to equal out with ability. Gimenez provides nothing for the future including leadership as he will be gone in a month. "For how long?" is the question. Falvine can't seem to quit him. I wouldn't rule out him sticking around like a bad toe fungus ... but a toe fungus that can teach everyone else things. That last line made me laugh out loud. Chris Gimenez the Educational Toe Fungus. if we need a catching coach gosh i dont know where we could find one....Oh hey Joe...whats up? But seriously whats not to like about Gimenez? We have to know he plays because he loves the game. He would be a great teacher to backstops and hurlers as well if I thought they were even thinking about that. To read the comments it seemed like we made this move to do Wilson a favor and bring their old buddy Gimenez back. No doubt he has a fond history with Shelton too. Maybe he's here to become the next bench coach?. It could also be animated show that re-imagines all of the "very special episodes" from '80s and '90s sitcoms. The Fungus works to keep Buxton and Sano from going in the backroom of the bicycle shop to watch nudie cartoons and drink juice boxes that make them sleepy. He helps Kepler air-guitar Doors songs to understand the drunk driving death of his best friend. The Fungus might even have it in him to help Rosario and Austin convince the girl from Jurassic Park to tell the authorities that her step-dad is hitting her. The important thing is that they're learning. But seriously whats not to like about Gimenez? How about the fact that he couldn't hit water if Astudillo was sitting on his shoulders in the deep end of a swimming pool? The Gimenez Paradox: Gimenez on the roster to provide 'veteran leadership', but his presence on the roster is the strongest sign that the Twins can't be lead anywhere other than a losing season! First of all, thanks Ted for a wonderful and insightful interview. I think it offers an interesting perspective to the current team, the FO, the foundation of a team, etc. Personally, I absolutely believe leadership is a real thing. And it can come in many forms. Reading the interview, I couldn't help but think about Hunter and what he may have brought to the team a couple years ago. And I don't think a "presence" should just be ignored. I'm even reminded of years ago and the affect Redmond had on the team as a decent but not great player who worked hard, contributed, and did his naked locker room walk through when he felt the team needed it. Laughable? Of course! So is the Hunter dancing! Or Colon last season and his jovial personality and mediocre-quality performances. On a team, or in a work force, to suggest leadership and personality is unimportant is ludicrous. Now, Giminez has no future with the Twins, and I think we all know that. Same with Wilson, traded for Giminez. (Still not sure i can wrap my head around the deal). Personally, considering both were signed on milb deals to begin with, not sure why Wilson was brought in vs just keeping Giminez. My personal opinion for the trade? Wilson taught Garver and showed him some things. The FO brought back Giminez for a second lesson. I believe in leadership, as well as leadership by example. I also believe Belisle is hanging around for the same reason. I get it! But at some point, you still have to look at the 40 man roster, and September promotions, and have to make some smart and hard decisions towards next season. I think there have been a couple bad mistakes in this area. I would really like to see Giminez as a coach in the system next season. Gimenez and Astudillo allow the Twins to carry one less bullpen arm if both make the team in 2019. I do think it is likely Gimenez will be a coach somewhere next year.I also feel the clubhouse was not great this year (don't know if it was toxic, but probably was close). Twins may have to do a better job of monitoring the players offseason.It may not be possible but Twins cannot afford Sano to show up way overweight and out of shape and Buxton not to have spent a lot of time working on his batting and his approach to hitting (maybe a month or two of winter ball will help), if not maybe it could be a reality check for him. Leadership matters. FO, managerial, and club house. The Washington Nationals are an organization that doesn’t appear to have any. There have been many articles written. Here is a summary. I do think it is likely Gimenez will be a coach somewhere next year. I also feel the clubhouse was not great this year (don't know if it was toxic, but probably was close). Twins may have to do a better job of monitoring the players offseason. It may not be possible but Twins cannot afford Sano to show up way overweight and out of shape and Buxton not to have spent a lot of time working on his batting and his approach to hitting (maybe a month or two of winter ball will help), if not maybe it could be a reality check for him. Sano should have a full off season and no reason why he can't show up ITBSOHL (in the best shape of his life). One look at him in the spring may be telling. I would think Buxton would be super motivated, whether or not the twins need to be vilified in his motivational equation I guess we'll find out. Great interview. Of course leadership matters. It is just that talent matters more. If only the Twins had a veteran player. A player with catcher experience who doesn't play every day. Maybe someone who has been with the team for over a decade. Maybe such a player could be expected to provide some leadership. Alas, I guess the Twins will have to get their leadership from outside sources, for the final couple months of a lost season.